In response to my threat of a federal law suit, Georgia Secretary of State Brian Kemp has coughed up the names and addresses of every one of the half million voters he cancelled off the registration rolls in 2017. One in ten voters – disappeared WITHOUT NOTICE. Look up your name or those you know, with the zip code. We'll send back you entire registration address. If that's you (or a former address of yours) re-register today – the October 9 deadline is almost here. Kemp's purge list includes those wrongly tagged as having left Georgia by Kris Kobach of Kansas, using Kobach's racially poisonous, long discredited Interstate Crosscheck list. 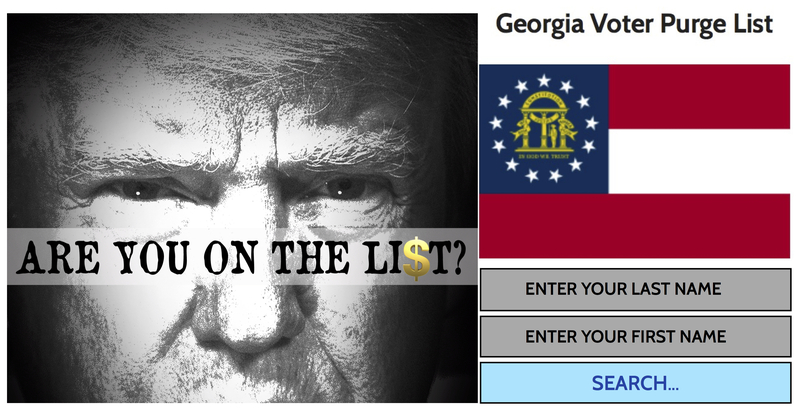 I’ve got the list of every purged Georgia voter – take a look. Thousands of citizens have wrongly lost their voting rights! It's like the days of Mississippi burning when freedom riders went into the Deep South to get black folks to register to vote and they were met with fatal resistance. Although more black folks are able to vote massa is finding ways to sabotage that. But some students here in Cali have no clue how important the vote is. They are too busy protesting so they can put on their Instagram or facebook. In some places, we are just giving massa want he wants. And there are other places where Blacks are totally serious about their vote-we need to bridge both together so that we can have a collective voice. Otherwise....white folks are gonna take every means....every trick to keep Blacks from voting. But!